When the Boston Bruins drafted David Krejci at the end of the second round (Detroit’s pick acquired via Los Angeles a year earlier at the 2003 NHL draft) the Czech teenager had frosted highlights in his hair and used then-B’s scout and former draft choice Otto Hascak to translate for him. He didn’t have anything all that profound to say to reporters, but the team’s front office gushed in the usual way about how excited the B’s were to get Krejci where they did and were effusive in their praise of his hockey sense and potential as a No. 1 or 2 NHL center. 11 years later, Krejci is among the NHL scoring leaders (albeit real early) and dropping the kind of thoughtful quotes that he’s been delivering with an articulate though soft-spoken and thickly accented delivery since 2009 or thereabouts. That was when posted his best offensive season and emerged as the top two line center current assistant GM and former amateur scouting director Scott Bradley said he could be in Raleigh, where the ’04 draft was held. When David Krejci was asked after the Bruins’ 5-3 victory over the Arizona Coyotes on Saturday if he was at all surprised how quickly the Bruins’ power play has come together this season, the center seemed a bit perplexed. It wasn’t an off-the-wall question, considering how much trouble the B’s have had on the power play in the past, but why would Krejci be surprised? Krejci didn’t get his generous contract extension, the one that pays him north of $7M and represents another significant bite of the B’s salary cap apple, based on his statistics. Even by modern NHL standards, where scoring is down compared to where it was in the 1980s and early-to-mid 1990s, Krejci’s regular season production is pretty pedestrian. Where the native of Sternberk in the Czech Republic has raised the bar and proven his worth is in the playoffs, when his points-per-game average rises from 0.75 to 0.83. Had not not been for his struggles in the 2014 postseason (he wasn’t alone, either) with a mere 4 assists in 12 games, that postseason average would be even higher. But Krejci has also proven his worth as a leader and student of the game. He might be a quiet guy by nature, whose voice is so soft that you’re out of luck if caught in the very back of a postgame scrum without a recorder that can pick up a pin drop or canine-like hearing; but don’t be fooled. Krejci is one of the fiercest, most driven and uncomprising competitors in that room. The players know it. The coaches know it. Management does too. And the fans, well…let’s just say that in the world of salary cap, flashy plays and what-have-you-done-for-me-lately, even if some of them are aware of how good a teammate he is, it didn’t matter to many given the lack of scoring in the 2014 playoffs and the carryover to last season, much of it spent on the IR. Right now, Krejci is in his prime at age 29, and he’s playing like one of Boston’s top paid players for a pretty simple reason: he knows that he must. In an effort to get Boston’s salary cap situation better under control, more in the way of established talent left the team than came in last summer. Slow start in Los Angeles aside, Milan Lucic still represented a significant loss in production (not to mention one of Krejci’s established wingers), so it was critical for the veteran center to not only begin the new season healthy, but find away to translate his effort into production. Krejci is not a dynamic skater, so to the untrained eye, he can look at times like he’s floating and not getting much accomplished. However, when you break down the goals he’s been scoring and the plays he’s made in the first five games, you see a player who is performing not only with confidence, but is emulating that critical element of any real NHL scorer: the ability to get to the right spaces in the offensive zone where he can either get the puck to the teammate best positioned to finish, or…screw it…score the goal himself. Go back and look at his power play goal against Arizona. When he takes the pass from Torey Krug, he’s in that sweet spot by the left faceoff dot, coiled like a cobra ready to strike and he one-times a bullet that Coyotes goalie Mike Smith had no chance-none- of stopping. Unless Krejci hit him with it, which, he didn’t. Krejci’s resurgence matters because the best way a player like him can lead is by example. When the younger skaters on the team watch how effective he is, see how he creates magic from the mundane but does it with a set of tools that has never earned him a great deal of respect outside of Boston, they realize that with a willingness to work and do the best with what you’ve been given, good things are possible indeed. Like Patrice Bergeron, Krejci isn’t a rah-rah, in-your-face fiery leader who demands accountability and isn’t shy about calling people out. He speaks softly, carries a big stick and when he does have something to say, his mates listen. It isn’t an accident that Krejci wears an ‘A’ on his sweater. It’s not just because he’s scoring and winning faceoffs- the other players in the room look at him and say- “That’s the kind of veteran I want to be like,” and they embrace his example. One day, when he hangs up the skates, Krejci is going to coach hockey at a high level. He won’t be a fiery bench boss, nor will he rub elbows and hold court with those who cover his teams. But, to those future charges he’ll mentor and train, he’ll teach them more about the game and how to be successful professionals than most. That’s a long way off, though. For now- he’s making a difference and helping his team get back on track after an 0-3 start. If you ask him, he’ll say that winning is all that matters, and he’s telling the truth. But deep down inside, like any driven competitor who has found himself on the receiving of biting criticism at times, he couldn’t be happier to be getting the points. And he’ll work even harder to make sure they keep coming. I almost opted not to post this at all, because I do not want to this to turn into a debate about whether he should have been kept or traded, but in the end, I’m using this space to say goodbye to Milan Lucic, one of the more important (if misunderstood in recent years) players for the Boston Bruins over the near decade he skated up and down the left wing and (often) left a trail of tears in his wake. For those who follow the NHL, Lucic’s body of work is well known, regardless of whether you are a fan of the Boston Bruins or not. From the moment he arrived to the big league in his first real veteran main camp after the 2007-08 season (more on that later- yes, I know he was drafted in 2006), until draft day this past June when Chris Pronger of all people (it isn’t like I know him- he just happened to sit behind me on the bus headed to the BB&T Center from the hotel in Fort Lauderdale and happened to be checking his phone when I sat down.) broke the news to me that Lucic had been traded to the Los Angeles Kings for their 2015 first, defenseman Colin Miller and goaltender Martin Jones (since dealt to San Jose for their first in 2016 and college forward Sean Kuraly), Lucic was one of the most visible faces of the Bruins franchise. As the league’s premier power forward in terms of his blend of physical prowess and ability to score, Lucic was far more appreciated outside of Boston by media and fans of other clubs who longed to have a similar presence on their respective teams, but could often only watch helplessly if Lucic was on his game and hurtled around the ice like a wrecking ball, daring anyone to stop him. Alas, in recent years, that version of Lucic, the one who had arrived like a meteor at age 19 on the heels of a Memorial Cup championship, and went supernova in terms of his popularity and impact by the time the B’s captured the 2011 Stanley Cup in his own hometown of Vancouver, had become at times an empty caricature- a player who wanted to intimidate and be that force of nature, but often got caught up in sophomoric displays on and off the ice that detracted from the immense player and person he was capable of being. By the time the 2015 NHL season came to a merciful end for the B’s, a lot of fans were ready to see Lucic go. To a degree, I understand that. The salary cap has made the folks who cheer for the laundry much more clinical in their assessments, especially when players like Lucic see their salaries rise to the point of being cost prohibitive. Lucic’s cap hit was too high for what he was bringing to the team, and with unrestricted free agency looming in the summer of 2016, he was due to receive offers seemed certain to go north of $6 million, perhaps as high as $7 million or more- a price that Boston simply could not afford. So, new GM Don Sweeney, recognizing that the timing was right rather than wait and risk an injury that might crater his value, moved him to the one team that has been reported should have been the club that had him all along- the Kings. I get it, I really do. But it doesn’t mean I have to like it. Rather than recap all of his years in Boston, I thought I would share a lesser-known tale about Lucic- how he almost was not a Bruin in the first place, and also provide some perspective on my own personal connection to him- one that in my mind- transcended the game he played and the job I did to cover the team for New England Hockey Journal. At age 15, no one in the WHL had time for Milan Lucic. Completely snubbed in the WHL bantam draft, he almost gave up his dreams of playing pro hockey. That’s what quitters do, after all– they make excuses and justify their lack of success as something unattainable in the first place. Not the son of Serbian blue collar parents from Vancouver, though- he got over his disappointment, rolled up his sleeves and went to work in the BCHL, earning his way to the WHL the hard way…with his fists and on occasion- soft hands with the Coquitlam Express. 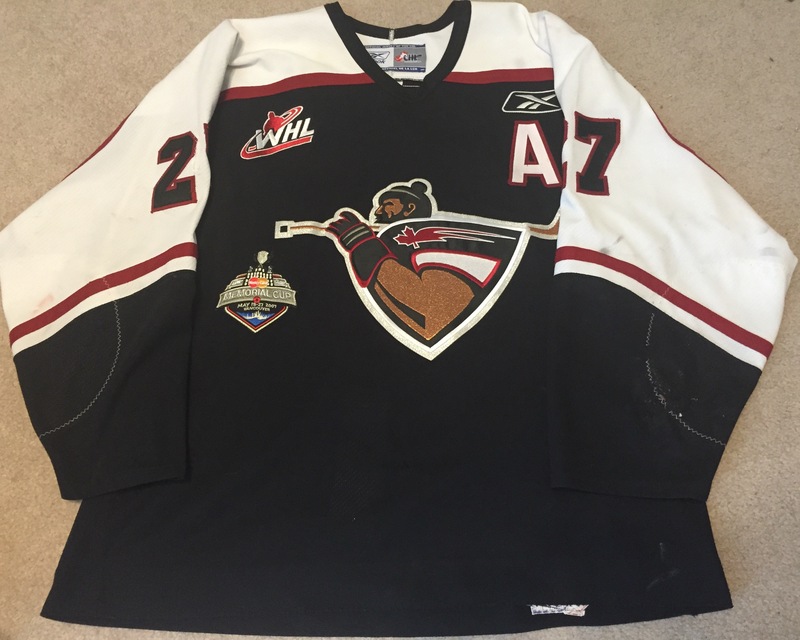 He caught the eye of the Vancouver Giants- the WHL club nearby and by the end of that year, was brought in for one regular season game and a pair of playoff contests. Coach Don Hay saw all he needed to at that point, and Lucic came back for his NHL draft season, spending the entire year in the WHL, and scoring just 9 goals but showing flashes of the talent that would eventually make him one of the the NHL’s most recognizable if polarizing players. As fate would have it, Boston’s then amateur scouting director was convalescing in his hometown of Vancouver after beating a sudden onset of cancer in his knee and having successful surgery to remove it before it was too late. Unfortunately (or fortunately as this tale will show) for Scott Bradley, he couldn’t travel, and so whereas he would normally be jetting all over North America and Europe at the beginning of the 2005-06 season to watch the top-rated late 1987/1988-born hockey talent, he was stuck at home. As a result, Bradley saw far more Giants games than he would have, and the burly No. 27 whose skating was rough beyond belief but was creating space for his teammates and establishing a reign of terror in the toughest league in the CHL started to grow on him after Bradley saw little early on with Lucic that resembled NHL material. By the time Bradley was cleared to do more work-related travel to scout other areas, Lucic was his guy, a player he believed was only scratching the surface of his potential. Fast forward to the 2006 NHL Entry Draft. Bradley was still sky-high on Lucic, but so were the Kings, whose guys Bradley had seen at Giants home and way games and guessed were also impressed with his upside. That year, the B’s had a pair of second-round picks- they had traded their own (35) to Washington as part of the 2004 trade for defenseman Sergei Gonchar, but picked up a compensatory selection (37) for not signing bust first-rounder Lars Jonsson from 2000 and then acquired Edmonton’s 50th overall choice as part of the deal that sent Sergei Samsonov to the Oil a few months earlier. Bradley, who had watched the Nashville Predators grab defenseman Cody Franson just a few spots before the B’s a year earlier in the third round, when the team had seriously talked about grabbing him early in the second round instead (they went with Petr Kalus), pushed for Lucic at 37th overall. Yes, he reasoned, it was early, but he was sure to be there, and given his potential payoff, was the best way to ensure the B’s landed him. However, a disagreement at the table occurred, with several scouts lining up together to argue for talented Russian defenseman Yury Alexandrov there instead. Interim GM Jeff Gorton, in what most folks connected to the game would say was surprising given that his amateur scouting director wanted Lucic there at 37, sided with the area scouts and went with Alexandrov, leaving Bradley to sweat out the next 12 selections in hopes he could get his man at 50. You see, the Kings owned the 48th selection, and all the signs pointed to the fact that they were all set to take Lucic there. Fate intervened once again, however. A report in the Montreal Gazette quoting former Kings scouting director Al Murray, said that at the time of the 2006 draft, recently hired Kings GM Dean Lombardi felt that the team needed a defenseman, so as their pick came up, he turned to his scouts, most of whom were on the same page and united in their desire to draft Lucic. Instead, the new boss wanted to know who the top defender on their board was, and the answer came back- Joey Ryan of Malden Mass. by way of the Quebec Remparts. The rest, as they say, is history- Ryan to the Kings and two picks later, the Bruins called Lucic’s name to a spontaneous (and loud) ovation of cheers at the old GM Place as many of the Canucks supporters in the place were well acquainted with Lucic from his Giants days. 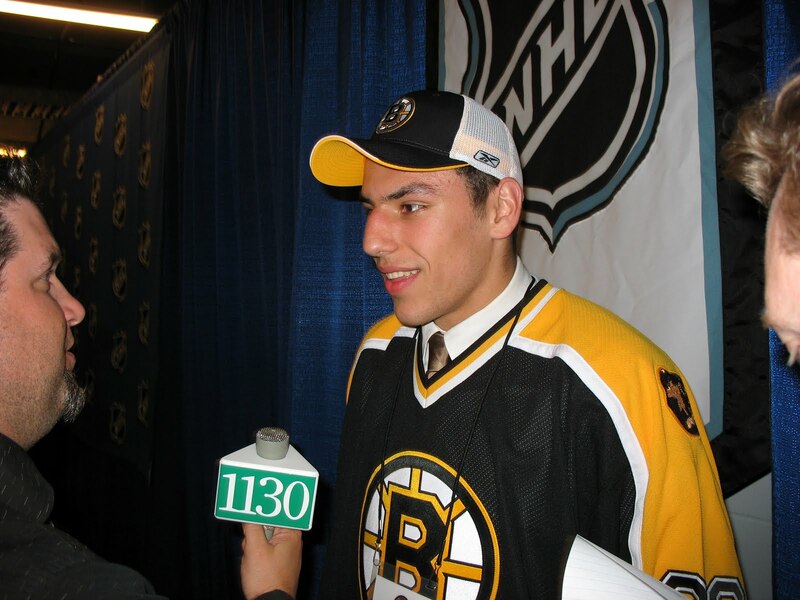 Many saw the pick of Lucic as a reach at the time. After all, he’d managed a paltry nine goals that season, and even if he was tough- why would you take a player like that in the top-50? Some of those concerns were allayed when we first met Lucic in the bowels of the arena in his Bruins sweater for the first time. He was thrilled and genuinely earnest in his assessment of the situation- being a top-50 NHL pick after being passed over in the WHL lottery felt pretty damn special. That fall, Lucic came to Boston, but was only allowed to participate in the rookie camp portion. Phil Kessel was dominating the buzz as the team’s top selection and after cratering the year before, the B’s had spent huge in free agency to bring in Zdeno Chara, Marc Savard. With other veterans up front like Shean Donovan, Mark Mowers, Petr Tenkrat (TENKRAT!- sorry inside joke there), Yan Stastny and Jeff Hoggan to name a few, the club sent Lucic and Brad Marchand (taste the irony, eh?) back to their junior clubs without giving them an opportunity to take the ice with the veterans. I remember talking to Lucic about it after the last rookie camp scrimmage and he was genuinely ticked about it. I recall very clearly him telling me “I skated my bag off” all summer to prepare for main camp…it clearly did not sit well with him that he wasn’t welcome there with the vets. At the same time, he said he understood and would work that much harder to make an impression during the season and be ready to compete in 2007. Therefore, when I said earlier, that he made the Bruins out of his first training camp opportunity- that’s the truth. Like the WHL, he was snubbed his first time out. We ended up talking a few times while he was still around the team, and he remembered me from the draft. I mentioned in passing that I might not be around to see him at camp in a year because there was a good chance my unit would be sent to Iraq. I recall him stopping what he was doing, getting very serious, and shaking my hand while putting his hand on my shoulder and wishing me luck and safety. He was genuine there, and while I didn’t want to make a big deal of my Army service, it was nice to see a young guy show his appreciation the way he did. Indeed, my unit was soon after alerted for a deployment (my second) to Baghdad where we would spend 15 months as part of the troop surge in 2007-08. While I was over there, I followed Lucic as best I could- tracking his 30-goal WHL campaign followed by winning the 2007 Memorial Cup. He was named captain of the Giants for the 2007-08 season, but that would not come to pass as he made the Bruins the following fall and went on to post a memorable rookie season with modest scoring (8 goals, 27 points) totals but won the hearts and minds of the Boston faithful with his energy and physicality. By the time I returned from my deployment at the end of the 2008 season, I was transferred to the Washington D.C. area over the summer. The Bruins played their last preseason game at Verizon Center against the Washington Capitals (an overtime loss with Manny Fernandez in net). When I walked into the visitors’ dressing room, Lucic was seated over at the far end, still with most of his gear on, but we made eye contact and he immediately bounced up and came across the room to shake my hand and welcome me back. It was a small thing for sure…but for me it was a big thing. Though we did not stay in contact during my tour in Iraq, he remembered that I had been overseas, and seemed extremely glad to see me again. It’s not like I had covered him extensively before I left for the desert, but I guess I made enough of an impression and that simple recognition and act of making a small effort to simply say hello went a long way and tells me a lot about who he is as a person. That interaction framed all further contact I had with Lucic while covering the team from late 2009 until this past June when he was dealt. Even if not interviewing him as part of the coverage, he would always make time for a friendly chat to catch up, as I am not around the team on a daily basis as the beat reporters are. In short, it was the Milan Lucic I got to know when the cameras and recorders were not turned on that I got to know the best, and will always be grateful for. He was honest, sincere, and even if some of his actions reflected poorly at times, I believe that he tried his best to do the right thing and the emotions of playing on the edge like he did sometimes pulled him over to the wrong side. So, to make a long post short (and thank you for allowing me to indulge in my own personal accounting here), Lucic will be missed far more than most are letting on. Even if he didn’t fight as often near the end as he had done before…even if he didn’t move his feet with the consistency that a player of his status and cap hit demanded, there were times when he was in a class all his own as a force of nature. Those moments simply weren’t enough for a lot of fans…and the team decided to move on as well. But to me, Lucic symbolizes an important time in Bruins history- as the franchise has won just six total Stanley Cup championships since 1924, he and his 2011 mates established a legacy that will always be respected in Boston. He was the right player, at the right time. His 139 goals, 342 points and 772 penalty minutes in 566 career NHL games with the B’s won’t land him at the top of any of the team’s statistical categories, but they do tell part of the story of a player who wore his heart on his sleeve for eight seasons. The Kings fans and media, if they haven’t figured it out already, are getting a heck of a player. One, if his career trajectory is to be believed, is probably going to bounce back with the best season of his career. 35 goals is not out of the question, and the Western Conference clubs that used to see Lucic only on occasion are going to quickly tire of him finishing his checks and wreaking havoc. How do you wrap up a blog post about a player who had such a significant impact in Boston? I can think of no better way than to post this farewell/highlight video made this week by Twitter friend “dafoomie” (who does a lot of great work- you should check out his YouTube channel). The images will capture all I could not, but the shadows grow long and it is time to bring this to a close. Good luck, Looch- thanks for the memories. The Rink Blog over at the New England Hockey Journal website is gone, but here is an article I wrote for it on Danton Heinen last March after I had a chance to talk to him during the NCHC playoffs. It’s some bonus reading for a guy who should be ranked solidly inside the top-10 of Bruins prospect lists in my view because he does so many things well. When the Boston Bruins called forward Danton Heinen’s name late in the fourth round of last June’s NHL Entry Draft, fans and prognosticators were sent scrambling for their guides and cheat sheets, to little avail. There wasn’t a whole lot of information available on the previously passed over forward when the B’s nabbed the 2014 NHL lottery’s mystery man 116th overall. However, in the months since, the former captain of the BCHL’s Surrey Eagles has emerged as one of the best players in the NCAA with a productive and mature game that belies his relative inexperience in the NCHC. Currently second only to hockey prodigy Jack Eichel (North Chelmsford, Mass.) in scoring among first year NCAA players, Heinen adjusted immediately to the competition at Denver and never looked back, posting 16 goals and 44 points in 36 games as of March 15, pacing the Pioneers in scoring. Denver head coach (and former University of Maine scoring star and member of 1993 national championship squad) Jim Montgomery is on the record giving much of the credit for Heinen to assistant David Carle, who recognized the potential and acted quickly to bring him into the fold last year. Heinen’s arrival on the collegiate stage has been so sudden, yet so jarring for certain NHL teams that completely missed the boat on him that the 19-year-old’s season has made for some interesting backroom conversations. Some evaluators point to a sudden growth spurt after he turned 18 as one aspect of the 6-foot, 180-pound Langley, B.C. native’s impressive showing at this level. As a July, 1995-born prospect who had been eligible for the 2013 NHL draft, and despite other ’95 players being in a similar situation such as Buffalo fifth-round draft choice and Brown freshman Max Willman (Barnstable, Mass. ), Heinen got nary a sniff from the various hockey draft publications. Even if the public lists weren’t tracking him, Heinen says he interviewed with multiple teams including Boston, during the course of the 2013-14 hockey season. Even though he knew he had some NHL interest, he wasn’t altogether positive he would get a call. He was following the draft on his computer at home, but when the fourth round rolled around, he wasn’t tracking the selections all that closely. Heinen learned of his selection from his family advisor via a phone call. Heinen’s rapid arrival in the NCAA and the potential that more and more around the NHL are acknowledging are why it is all the more baffling that so many seemed to completely miss on his potential a year ago. The Bruins, for their part, played it smart. Western Canada scout (and former B’s defender) Dean Malkoc watched him enough to get a solid perspective on the youngster’s potential, and then as is often the case with Boston, multiple scouts and members of the front office, including current assistant GM Scott Bradley (who makes his off-season home in British Columbia), went out West to see him. Unlike other teams who were perhaps on Heinen for a little longer than the B’s were, give GM Peter Chiarelli and his staff credit for taking him where they wanted to instead of playing the we can wait and get him later game that may have burned other suitors (Montreal rumored to be chief among them) and cost them a shot at one of college hockey’s hottest properties. It stands to reason, then, that at the recently concluded NHL trade deadline, the B’s reportedly had several teams asking them about the prized fourth-round pick. Given what he’s shown, don’t expect the team to give up on this prized asset unless any prospective team is willing to pay a significant return. All of the high praise aside, Heinen knows that there is still much work to be done. As has been the case for the entire season, he put words to action by scoring goals in both of DU’s playoff wins over UMD, extending his team scoring lead. The last player Montgomery coached who topped the charts as a rookie was none other than Calgary’s NHL Rookie of the Year candidate Johnny Gaudreau, who did it with the USHL’s Dubuque Fighting Saints in 2010-11. While Heinen has a long way to go before he will generate the kind of buzz that followed “Johnny Hockey” during his electric Hobey Baker-winning career at Boston College, he’s far exceeded the modest expectations that preceded his arrival in the Rocky Mountains.